Every year you buy a Christmas tree, bring it home for a few weeks, then leave it out on the sidewalk for the recycling truck. A living Christmas tree requires more care than the cut variety. Seems like such a waste, doesn't it? This year, consider buying a living Christmas tree instead of the cut variety. A living Christmas tree is a bit more work, but they do have their pluses. They're not as messy because they won't have as much needle drop. They're less of a fire hazard because they don't dry out much. You'll have a new tree in your yard next year. Before you start planning where you'll plant the tree, you should know that a live tree requires more care than the cut variety. Plus, you may have to make some compromises on size. Most live Christmas trees are white pines, spruces, and fir. But what you buy at your local nursery will be best suited for the growing conditions where you live. The main difference between a live tree and a cut Christmas tree is that live trees have root balls. Big, heavy root balls. Look for a big root ball: A 4-foot-tall tree should have a root ball at least 18 inches in diameter, preferably larger. The ratio should be 9 inches of root ball for every inch in the diameter of the trunk at the base. Look for a secure root ball: Make sure the root ball is firmly attached to the trunk of the tree and doesn't wobble. Look for needles that bend, not break: Slide your hand over a branch. If you end up with a handful of needles, the root ball has not been kept moist and the tree is not fresh. Needles should bend, not break. Look for living branch buds: Look at the tips of the branches. 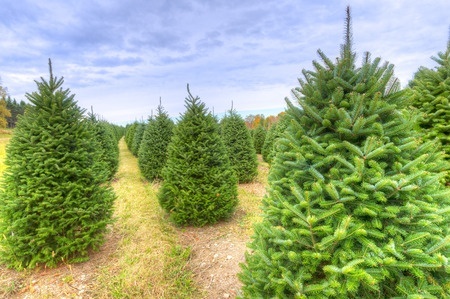 Trees are sheared or pruned each year to give them their Christmas tree shape. If there are no buds at the end of the tips, that means this tree was sheared too late; that means the tree won't grow next year. Most trees go dormant in the winter, and a Christmas tree is no exception. If you keep a living tree indoors too long, you run the risk of waking it up. Prolonged warmth might make it think spring is near and it will begin putting out tender new growth. This is a recipe for disaster if you plan to plant it out in the cold, icy yard. Limit the time your living Christmas tree is indoors to a week, max. Limit time inside: Many growers advise keeping live trees indoors no longer than 3 to 5 days. If that seems to brief for your family, at least limit its stay to no more than 1 to 2 weeks. Water daily: Instead of a tree stand, a live tree will be in a bucket. It may need as much as a gallon of water every day because it's going to be losing a lot of water through transpiration in the warm, dry house. Choose a cool spot: Place the tree in a cool area away from sunny windows, flaming fireplaces and heat vents. If you plan to plant the tree in your yard or garden after the holidays, find out how tall and wide that species grows. Unless it's a dwarf species, you probably are not going to want to put it against your house. Find a place where it won't block views or cause icy spots on sidewalks. You're going to have to live with your decision for a long time. One common error is planting trees too deep. Dig the hole only as deep as the root ball but 3 to 4 times as wide. To help your tree transplant better, store the soil from the hole in your garage or shed to keep it warm. Line the hole with straw. After storing your tree for 2 to 3 weeks to acclimate it to outdoor temperatures, plant it with warmed soil from the shed or garage. Living trees cannot go straight from a warm living room to a frigid garden. Store the tree in a cool shed or garage for 2 to 3 weeks to acclimate to cooler temperatures. Continue to water it daily. Then transfer the tree to the pre-dug hole. Remove the burlap and plant the tree so that the warmed soil (from the shed, remember?) comes just to the bottom of the trunk. Water thoroughly with lukewarm water. Cover the hole with a 3-to-4-inch layer of mulch but be careful not to let the mulch rest against the trunk. Don't get your hopes too high. Bringing a living tree indoors is a big shock to its system - and survival rates are low. But give it a try. Even if the tree doesn't make it, you're no worse off than you would have been with a cut tree. Enjoy the holiday season!